IDA from 01-07-2014 is to increase by 2.9%. AIGETOA KERALA HUMBLY REQUEST ALL OF YOU TO LEND A HELPING HAND TO THE AGRIEVED FAMILY OF LATE SRI.ANIL GEORGE. WE EARNESTLY REQUEST ALL TO DONATE GENEROUSLY. Circle team met GM Admin today and discussed various pending issues. 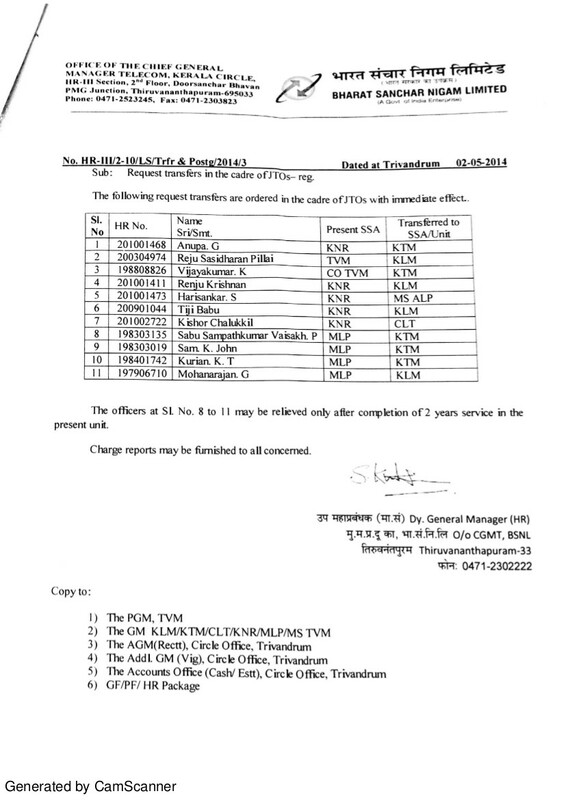 First set of request transfer orders issued. Circle administration assured that remaining cases will be dealt positively and orders will be issued. NTT DoCoMo, Japan’s biggest telecom operator by subscribers, has said it will sell its entire 26.5 per cent stake in Tata Teleservices Ltd (TTSL), thus exiting India five years after it entered the market. An awareness session was convened by BSNL management on creating a new tower subsidiary company by hiving off the tower business of BSNL. The session was attended by General Secretary Shri Ravi Shil Verma and Vice President Shri Mantosh Kumar. From the presentation, it appeared that the whole exercise is more intended towards engaging a strategic partner as phase-II as a JV Project. We expressed our concern to the management side that if at all the exercise was done for creating a more focused approach on tower business then other revenue earning verticals also require a stronger focus, so how BSNL is going to guarantee that other verticals will not be converted into a similar type of subsidiaries and if it is not an indirect form of disinvestment. We suggested that instead of creating a subsidiary, better option is to create a separate vertical for the same if BSNL senses a wide business opportunity in this segment. Our friend Anil George JTO Mobile Services Wayanad met with a tragic accident at Changaramkulam on 22nd, Tuesday evening. 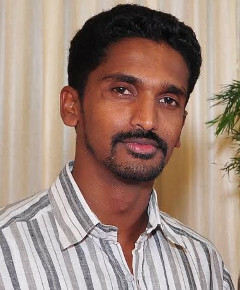 He was hospitalized at Thrissur but passed away today at 7:45PM. We share the grief of his family and pray almighty to offer peace to the departed soul. The DoPT case ( For 1:1 Promotion in JTO(T) to SDE(T) ) , came for hearing before honorable CAT , EKM today . After arguments, the case has been posted to 26th May 2014 for detailed argument and further disposal . Details Will be uploaded soon..
AIGETOA is the only platform to raise the voice of direct recruit executives but AIGETOA name alone cannot help you to get your rights. It is only you who can help yourself. We are very thankful that some persons have started raising the voice for the issues related to direct recruits however in view of the history; there is a dire need to brain storm the basic before joining hands with them. Standard pay scale of E2 to JTO/JAO: Pay scale of JTO/JAO should have been E2 from the inception of BSNL but same was downgraded to E1A to compensate for the pension contribution of absorbed JTO/JAO and the same was agreed by these so called messiahs. There is no hurdle to extend E2 pay scale to direct recruits JTO/JAO but striking for E2 pay scale to all JTO/JAO is nothing but just to create pressure to the management so that management may not extend the E2 pay scale to direct recruits. Professionally qualified direct recruits are entitled for even E3 pay scale from 01.01.2007 in lieu of upgradation of engineering graduate in Government of India and other CPSEs but the same has never been demanded for the reasons best known to them. 30% superannuation benefit: The recommendation of 30% defined contribution towards superannuation benefit in CPSEs is applicable to those who are not covered under defined benefit of government pension. Some persons are demanding the same for direct recruits through their websites but internally they are forcing the management to compare the CTC on contribution towards retirement benefit of direct recruits and absorbed executives. CPSE cadre hierarchy/no external MT, DGM: On one side, they are crying for implementation of CPSE cadre hierarchy in BSNL in respect of career progression of executives and other side they are forcing the management to degrade the bench mark and no weightage for qualification which is leading to unnecessary delay. Professionally qualified direct recruits JTO/JAO recruited through All India open competition is already MT who should have been the succession of top management in BSNL but these do not allow them to get their entitlement. They are forcing the management to put us below so that there can be scope for management to make another MT recruitment ignoring already recruited professional qualified JTO/JAO. Executives cannot demand, in fact there cannot be any negotiation/bargaining in respect of pay, career and retirement benefit as these are finalized by Government of India through DPE. Executives can only force the management to implement the DPE orders/guidelines. All the three issues mentioned above are entitlement of Direct recruits executives in BSNL but it is demand for others. Some persons are trying to insert their individual demands in between our entitlements not to gain anything but just to create hurdles. It is really painful to see that some of the direct recruits are being part of creating hurdle on their own entitlements. This association appeals all the direct recruits to first analyze and then decide. This association appeals to every direct recruit to please stand together on the platform of AIGETOA for your own cause. Don’t think that some of the direct recruits can enable you to get your entitlements. Don’t think that somebody will come to invite you. Some of the representatives are putting their day and night, blood and sweats. Support them who are fighting for your own cause by extending your hand before they get exhausted. DOPT case came for hearing today in Hon. CAT Ernakulam and it is posted for hearing on 24th March 2014. Stay continues. 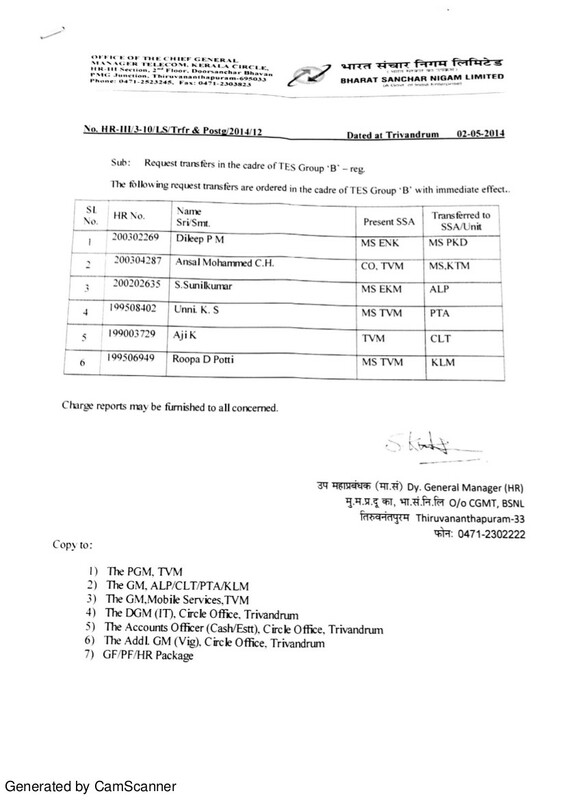 Kindly recall our association's discussion with GM(HR/Admin) regarding the transfer issues, Click here for the list submitted to Circle administration in the last week by association. Feel free to contact office bearers of AIGETOA in case of difficulties if any. AIGETOA KERALA Circle body extends its heartfelt thanks to all members and supporters for the perseverance shown.